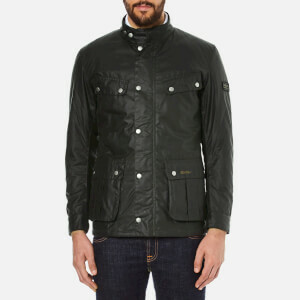 Men's wax jacket from Barbour International. 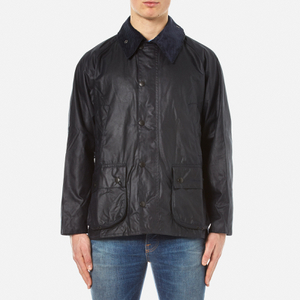 A rework of the brand's iconic 'Enfield' jacket, the 'Duke' is cut from medium weight 6oz waxed cotton with a slim fit, and features a cord-lined collar with throat latch, and two way zip fastening with popper secured storm flap. 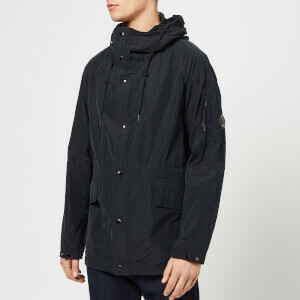 Offering robust insulation and great practicality, the moto-inspired coat is lined in warm, quilted nylon and features two lower bellow pockets with pleat detail, and two upper pockets. 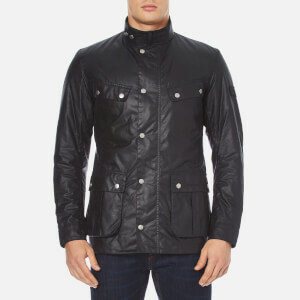 Complete with corduroy-lined cuffs and signature branding to the left flap pocket and left sleeve.